This is my first post on banner ads, and as such it is also going to serve as a bit of an introduction into how we use banner ads at eRetailing. (At eRetailing, customers use our design centers to add text and art to apparel and other products, which we then print on demand. To learn more, ready my post on our flagship site, Customized Girl.) If you want to skip to the Facebook vs Fansite argument, scroll down a bit. I do a lot of banner advertising on the Google Display Network. I’ve used all kinds of networks over the years, including AdBrite, Chitiqa, and others, but Google has always been the best. This is because Google has the largest inventory (thanks to Adsense) and the best method of targeting: keyword (aka contextual). At eRetailing we make sure every ad dollar we spend results in a direct Return On Investment. Maybe someday we’ll engage in more “brand” advertising, and we’ll use TV or billboards or Yahoo to try to sink into the public subconsciousness, but right now it’s all about making the most money possible with each individual dollar. Luckily for us, the internet exists which makes this super easy. The key, for us anyway, is using image ads to plant a very clear idea in our viewers’ minds. We prepare our users so that they have a very specific set of expectations and when they click on one of our ads we immediately satisfy these expectations on the landing page. 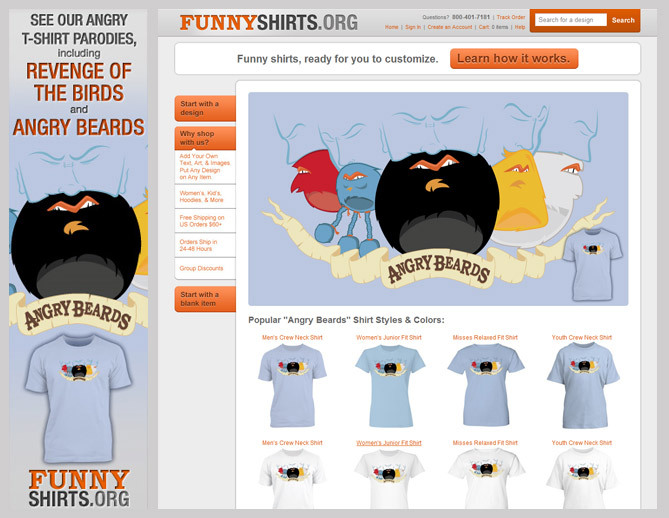 We do this by featuring the design on the item (often a t-shirt) as largely as possible on the banner. The design (like “Matt’s Tight End” on a pair of hot shorts or “Welcome Home Soldier” on an army wife t-shirt) needs to be simple with big block letters and high contrast. It needs to be “immediately readable”, which is to say, if someone glances at it out of the corner of their eye, they should immediately understand what it is. Our best results using keyword targeted banner ads, without question, have come from fansites. By fansites, I mean any site that was built to serve the fans of one particular concept, from fans of running, to fans of the latest video game, to fans of young adult novels about vampires. Interestingly, Facebook offers a similar targeting system. When you create your ad on Facebook, you can say “Okay, I want this to show up for anyone who is interested in running, or the latest video game, or young adult novels about vampires.” We can reach the same people who are devouring our ads on fansites! It’s great! Except it isn’t. It’s easy to think that the same surfers would be happy to see your ad wherever they are on the web, but that’s not the case. People are on Facebook (and formerly MySpace – yes, we tried that too) to communicate with their friends. They’re planning trips. They’re wishing you a happy birthday. But they are not geeking out over one of their passions. And they certainly aren’t shopping.